CPR/AED training is essential when implementing an AED program. Here’s some resources for CPR/AED training in New York’s Broome and Tioga Counties. If you’re outside these counties, see General CPR/AED Training Options. 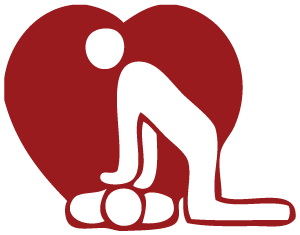 If you work for an authorized training center in Broome or Tioga County and would like to be included on our list or if you’ve taken CPR/AED training and would like to recommend a place, please contact us. Abell Safety Training was established in 2010 and provides individuals and businesses with CPR/AED, First Aid, Blood-Borne Pathogens and Fire Extinguisher training. These classes are provided using ASHI (American Safety & Health Institute), Medic 1st Aid, and First Safety curriculums. ASHI CPR/AED is designed specifically for laypeople and is an excellent choice for both the community and workplace setting. The program will help prepare people to respond to a cardiac arrest and choking. It conforms to the 2015 American Heart Association Guidelines Update for CPR and ECC (Emergency Cardiovascular Care). It is perfect for individuals who are not healthcare providers or professional rescuers but desire or are required to be certified in CPR and the use of an AED. Students must perform required skills competently without assistance to receive certification. Certification is for two years. Abell Safety Training covers Binghamton, Johnson City, Vestal, Endicott, Endwell, Kirkwood, Conklin and beyond. They will come to your facility or you can go to their location. Class size: up to 20 people per class. UVES has been a leading provider of American Heart Association (AHA) training and education programs in the Southern Tier of New York since 2000. They are a certified training center for the AHA and their offerings are geared toward various experience levels, ranging from the community layperson to the experienced healthcare provider. Classes can be taken at the UVES office or offered at your own facility. The AHA Heartsaver® CPR/AED course is an instructor-led classroom course that teaches adult CPR and AED use, as well as how to relieve choking on an adult. An AHA instructor conducts video-based lessons and works with students to complete their CPR and AED skills practice and testing. This course is for anyone with limited or no medical training who needs an AHA course completion card in CPR and AED use to meet job, regulatory or other requirements. The course meets the requirements for both initial and renewal certifications. Upon successful completion, students receive an AHA Heartsaver® CPR/AED course completion card, valid for two years. AED use. Upon successful completion, students receive a Part 1 certificate of completion, which allows students to continue with Parts 2 and 3. Part 2 – a hands-on skills practice session with an authorized AHA Heartsaver® instructor. Part 3 – a skills test with an authorized AHA Heartsaver® instructor. Upon successful completion, students receive an AHA Heartsaver® CPR/AED course completion card. Use the website link above for a current listing of courses offered by UVES. NOTE: When setting up an AED PAD (Public Access Defibrillation) program in New York State, it is a state-requirement to get CPR/AED certification to be knowledgeable in the operation of an AED. The American Heart Association’s Hands-Only™ CPR, also referred to as Anytime CPR® in class offerings, does NOT cover AED operation and does NOT provide CPR/AED certification (i.e., you will NOT receive an AHA course completion card). AHA Hands-Only™ CPR allows the general public to learn the basic CPR steps to become an asset to their community, providing immediate high-quality CPR prior to the arrival of emergency responders, in the event of a witnessed cardiac arrest event. This life-saving skill is crucial as a link in the Chain of Survival for sudden cardiac arrest victims. Classes posted on website link as they become available. Our Lady of Lourdes Memorial Hospital is a training center for the American Heart Association. 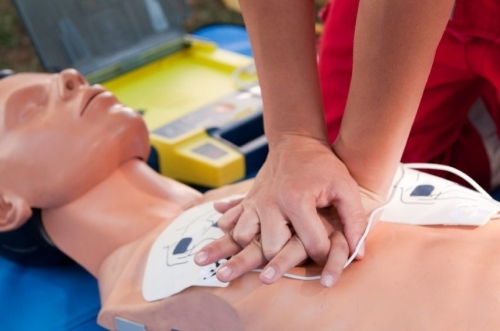 They offer the AHA Heartsaver® CPR/AED classroom course for community lay people. The course can be tailored to include adult, children and/or infants. Classes are held in the Learning Center Office on the main floor of the hospital. Contact the phone number above to set-up a class for your group. Minimum of 6 people (for one instructor). More participants can be included based on additional instructor availability. Class scheduling dependent upon instructor and room availability. The American Red Cross link above will allow you to search and sign-up for an American Red Cross CPR/AED class in your area. You can also call the number listed to sign-up. Onsite group training requires a minimum of 8 participants and must be set up over the phone (i.e., you cannot do it online). Thank you for getting CPR/AED trained and becoming a vital link in the Chain of Survival!